Our Butter Makes It Better! Only the finest Wisconsin Grade AA Butter receives the Old World Creamery name. Enjoy the rich and creamy flavor of our Old World Creamery Salted Butter! Our Old World Creamery Salted Butter is made and packaged in Sheboygan, Wisconsin using the finest Wisconsin milk and cream. Our staff expertly blends each batch, relying on both five generations of family experience and a state of the art production facility, and the delivers it fresh to your local grocery store. Salted Butter is great for topping toast and bagels, and keeps slightly longer than unsalted butter. Enjoy the rich and creamy flavor of our Old World Creamery Unsalted Butter! 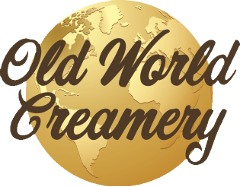 Our Old World Creamery Unsalted Butter is made and packaged in Sheboygan, Wisconsin using the finest Wisconsin milk and cream. Our staff expertly blends each batch, relying on both five generations of family experience and a state of the art production facility, and the delivers it fresh to your local grocery store. Unsalted Butter makes a great topping, and gives cooks precision control over their recipes.